Join APEX Motor Club on the APEX track, and at local automotive events throughout the South West. A monthly club for car enthusiasts to share their passion, coffee and conversation. Let’s hit the streets! APEX members and friends will rally at the APEX Showroom and Office in Scottsdale, AZ before hitting the pavement for a scenic drive, hosted lunch and then return to the APEX Office for more seat time in the Simcraft 5-axis simulator! Pick your track, pick your car, hone your skills. We’ll see you all out there on the open road soon! Enjoy the valley’s most luxurious and exotic cars and adopt a new furry friend. APEX is sponsoring Cars & Canines with D Pet Hotels in Scottsdale and the #LovePup foundation, a free event, family and dog friendly event with vendors, cars and food trucks. All of the event proceeds will benefit the #LovePup Foundation! 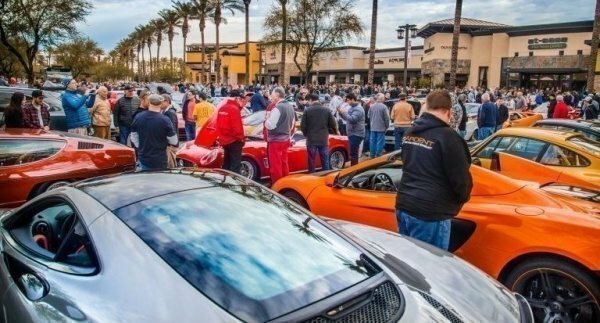 Apex Motor Club is a proud sponsor of the FIRST Annual Professional Firefighters of Maricopa Car Show, which also supports the Arizona Cancer Foundation for Children. Want to share in the reverie? Register your show car to display and compete for awards, donate to the Arizona Cancer Foundation for Children or bring a new, stuffed animal to donate to a child in treatment. The more cars the merrier!